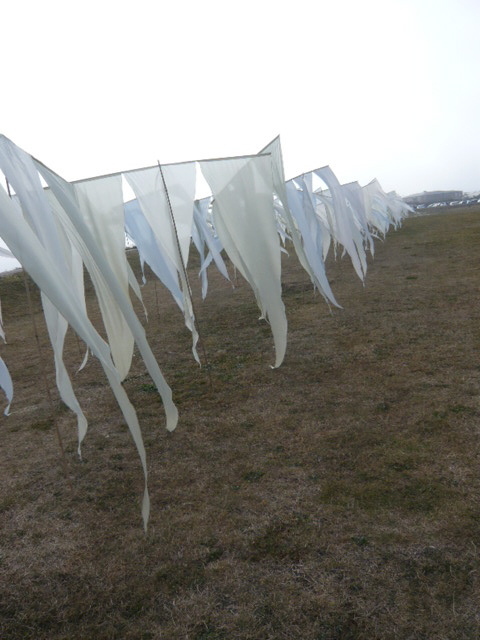 Jane Harding's installation on the Old bathing pool site in St Leonards was an ethereal joy. I watched them as they fought with the wind to assemble it but even in the early stages one could see the form, feel the beauty, a ballet set in the making . It ran parallel to the cycle track along the sea shore echoing the waves that spat at the pebble beach . I live opposite to the old bathing pool site and strangely the entry bell system on my block of flats is broken. Tinkling, almost temple like music can be heard from the system at all times and combined with the white floating flags it is like a gentle mourning for Sidney Little's Old bathing pool which was flagrantly destroyed by the council in 1986. White, is the colour of mourning in many Asian countries. This installation was welcomed with open arms by locals and visitors and it certainly showed a more aesthetic way of treating the bathing pool site compared with the thirteen shipping containers that the council believe will enhance the bathing pool site. Platform have campaigned against the shipping containers. They want to enhanse the site with the return of the bathing pool and a low maintenance sea garden where art installation can be installed. Their ideas can be seen on www.oldbathingpool.com. Perhaps the most amusing comment was from one of my visitors on arriving at my flat she thought that travellers had taken over the site......... the previous night strong winds had whisked away most of the flags leaving what looked like a bedraggled line of washing with a security man guarding it. You have to laugh. 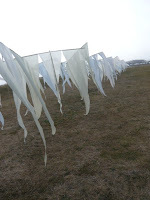 However Jane and her team worked until the early hours repairing and hanging the flags to perfection and once again the installation was an ethereal joy. Thank you Jane .